The Micro Clock mk2 is simple and probably even boring looking by most standards. Its housed in a rugged yet basic 3 inch by 4 inch chassis that provides optimum RF shielding. It has no lights, no frequency display, and none of the usual visual candy that your friends might envy, but thats because those items create unwanted noise that affect the signal. For a modest black box, it does its job incredibly well and at a price thats unheard of for this level of performance! The power supply is 9 volts DC using a wall wart thats capable of accepting both 120 and 240 volts AC. It features six selectable output frequencies from 44.1 kHz on up to 192 kHz. The output level is approximately 5 volts peak to peak. Jitter at the crystal oscillator is approximately 1 picosecond RMS, and its just under 10 picoseconds RMS at the output. Both of these figures are obtained using a Delta Sigma averaging method. The Micro Clock mk2 is compatible with all modern digital devices that have 75 ohm BNC word clock inputs. When we introduced the Micro Clock mk2, we didnt anticipate the amount of demand and controversy that managed to accompany it. External clocking is certainly a hot button issue. Some folks maintain that theres no basis for it; that its a sort of modern emperors new clothes. The reasoning behind this is that the device being clocked externally will simply filter the incoming clock signal through its phase lock loop, thereby eliminating any sort of benefit associated with the superior clock. In addition, the simple act of accepting the incoming signal and creating a new signal thats in phase will add some jitter. The biggest problem with this theory is that we know nothing about the PLL filter in question; its completely hypothetical. Many PLLs in pro audio are designed to filter out unwanted signals that are outside of the desired bandwidth, although some are configured to filter out unwanted harmonics that lie within the signals frequency band. Its incredibly rare to find one that does both at the same time. In the case of the Micro Clock mk2, there is very little undesirable in-band or out of band content (below 10 picoseconds using a Delta Sigma average). There is, however, an abundance of desirable harmonically related in-band spectral content; more so than the average internal clock. No PLL filter is designed to remove these desirable harmonics; theyre busy trying to remove the unwanted stuff. 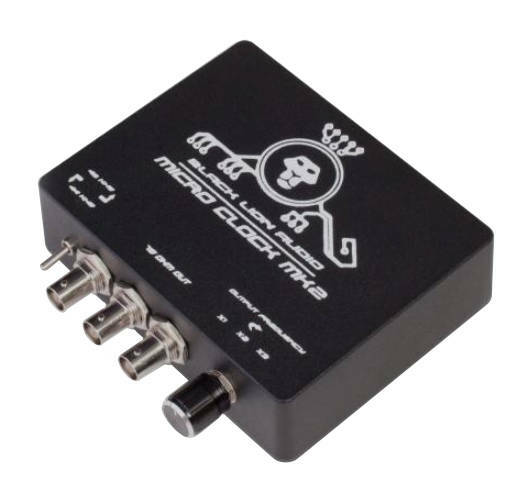 Simply put, the Micro Clock mk2 will not only provide an audible improvement to your conversion process, but it will do it as well or better than any other external clock on the market today. • Jitter: Maximum 1 picosecond of intrinsic jitter, less than 10 picoseconds of accumulated jitter measured using a delta sigma averaging method.